When planning a fundraising event, every tiny detail matters, and has the potential to make or break the experience for your guests. From the types of items available at your silent auction, to the ambiance of your venue and how well-managed your schedule is on the day of your event, there are a number of factors that contribute to how well-received and profitable your fundraiser will be. For this reason, it is highly recommended that event hosts and organizers do their research before starting the event planning process. Arming your team with the most relevant, up-to-the-minute information available ensures that you will make informed, perceptive decisions about the direction your event should take— increasing the likelihood that your attendees will be thoroughly impressed. 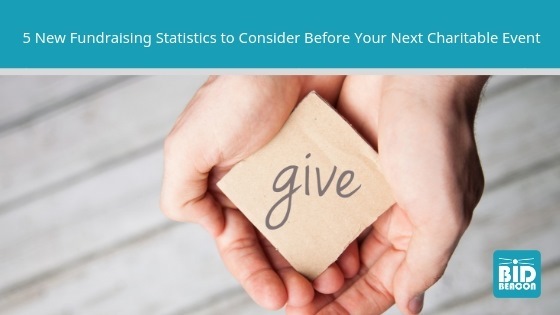 Thus, we’ll be taking a look at some of the most recent and compelling fundraising statistics, and sharing our thoughts on what makes them so pertinent to event planning in 2019. This may not come as a surprise, since online donations have been on the rise for a number of years now. But what is important for those who are event planning to consider is how convenient their online donation process is currently, and whether or not it can be improved. Long, cumbersome online forms and multiple-step donation pages could actually be hindering the profitability of your fundraising initiatives rather than leveraging it. In fact, forms with three or less fields typically convert at a 25 percent rate, while forms with six or more fields convert at 15 percent or less. Additionally, the number of people who use their mobile devices to access the internet and contribute to fundraising initiatives is rising, so it is important for supporters to be able to easily and conveniently access your website or online donation page from their cell phone. We highly recommend reviewing your online donation form and reducing the number of fields required, if you haven’t in awhile. Investing in an online silent auction software like Bid Beacon for your next event is a fantastic way to make donating a breeze during your fundraiser. Guests can bid on items directly from their mobile device and receive instant notifications when another guest has outbid them. This is one of our favorite fundraising statistics, since it is one that is often overlooked. Women are a major driving force behind philanthropic giving, and are the most actively involved in contributing to their communities. Thus, it’s essential to make sure you are catering to this demographic during the event planning phase. Include items with an emotional connection, such as a gift certificate for a family photoshoot, or a painting by a local female artist. This is one of the statistics on fundraising that every business and organization should be aware of. Holiday giving is a massive contributor to the success of non-profit organizations and fundraising initiatives. In fact, nearly one-third of all charitable giving occurs in December. Thus, planning a holiday-centric fundraiser should be an established part of any charity’s event planning strategy. No, that’s not a typo. It’s a surprising fundraising statistic, but it’s also completely accurate. In fact, people who earn $25,000 per year donate the largest share of their income at 16.6 percent, while those who make $500,000+ contribute 2.8 percent of their income. Thus, it’s important not to overlook low-to-mid income individuals when planning a charitable event. Be sure to select silent auction items that range in value, to encourage bids from guests with varying budgets. Additionally, always make information available at your events regarding volunteer opportunities. Lower-income Canadian volunteers contributed an average of 161 hours of volunteer work in 2010, which was 18 percent more than the highest income volunteers (136 hours). By connecting with supporters from all walks of life, you can expand the success of your fundraising efforts, growing a larger circle of people who want to help you achieve your vision. If this isn’t a sign that it’s time to invest in a mobile bidding app, we don’t know what is. More and more people are using their cell phones as their primary device, conducting all of their major online tasks conveniently from the palm of their hand. So, why not meet your donors where they already are? After all, the number of transactions completed through mobile devices increased by 50 percent over the last 12 months. With an online silent auction software like Bid Beacon, your guests are able to donate with just a few taps of their thumb. They also benefit from push notifications that inform them when they’ve been outbid, and discussion forums where they can chat with other attendees without having to physically approach another table. Not to mention event organizers also gain some convenient advantages, like simple, straightforward auction setup and detailed analytics. If you haven’t made the move to a mobile bidding app, now is the time to capitalize on this trend. ARE YOU READY TO APPLY THESE TIPS WITH THE HELP OF BID BEACON? DOWNLOAD THE APP FOR YOUR ANDROID OR APPLE DEVICE TODAY.